There are Guests that visit Disney World every year—some more often than that—who have never stopped long enough to take in the artwork that adorns the walls of the main corridor through Cinderella Castle, and if you’ll only be at Disney for a short time, you’ll want to be sure to take the time to stop. Here you will see some of the most amazing artwork in all of Magic Kingdom. 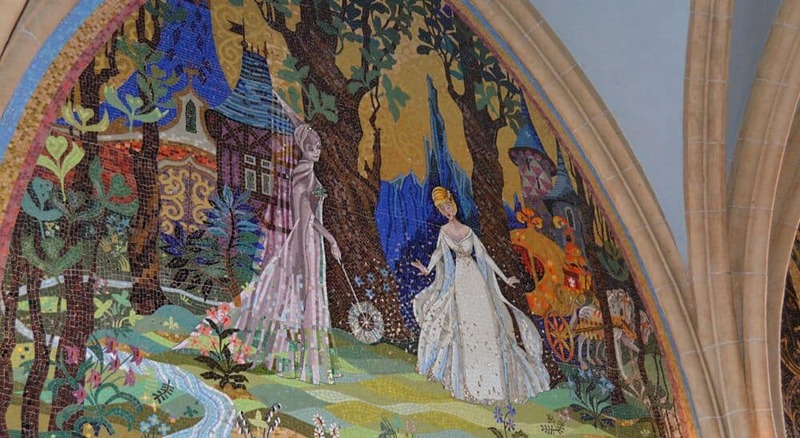 Along the walls of the corridor are five handcrafted mosaic murals—each one a beautiful work of art that depicts scenes from the story of Cinderella. Over 1 million pieces of glass in 500 different colors were used to create the mosaics. Some of the mosaics were even made with pieces of 14 karat gold and silver.